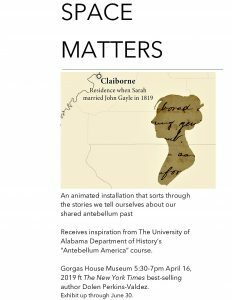 The installation, which is up throughout the month of June, receives inspiration from the research of students enrolled in “Antebellum America,” a Fall 2018 Department of History undergraduate course. Indeed, nuanced ideas are visually presented around three stories: Sarah Gayle, a journal-writing woman upends the southern belle stereotype. Horace King, an enslaved architect helps Robert Jemison Jr., a prominent slaveholder and politician build bridges. Nathaniel Kenyon, a Union officer passes unexpected time in a Tuscaloosa prison. Find out how these individuals and others unveil the degree to which space matters. To speak of space is speak of maps, but also the way in which the most unlikely people make claims to power on the basis of many things including where they are. This event is sponsored by the Frances J. Summersell Center for the South, the Departments of English, Anthropology, Gender and Race Studies, Communications and Information Sciences, and American Studies and UA Crossroads.  Special thanks are also owed to Dr. John Beeler, Professor of History; Alex Fries, graduate student in UA’s Geography Department, Craig Remington, UA Cartographer, Kat Flandermeyer, graduate student in UA’s Film and Television Production program and Brandon Thompson, Director of Gorgas House Museum. Curated by Sharony Green, Assistant Professor of History, the exhibit pays homage to bicentennial celebrations for the City of Tuscaloosa and the State of Alabama. 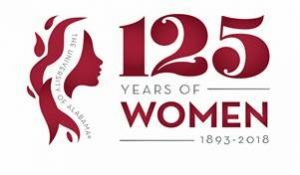 Women have made a significant impression on The University of Alabama over the past 125 years, starting with the first female students admitted in 1893. Women have impacted every aspect of campus life from athletics to Greek Life to the military. Significant increases of female students prompted the construction of the Women’s Campus to provide resources for the betterment of the female experience on campus. Female students and members of the university’s faculty and staff have made outstanding contributions to the campus community, the state, and the nation. Women of the Tide have graced the silver screen and written themselves into history. Over 125 years, great advances have been made; however, there are still opportunities for progress as women continue pushing the boundaries and influencing the future. This exhibit was part of the campus-wide celebration honoring women at UA over the last 125 years. Susan Hodgson began collecting dolls in 1949 at the age of seven while living in Austria. Since then she has grown her collection during her trips abroad and raising her family as well as gifts from friends who knew of her hobby. The dolls represent her life as a military wife and twenty-three household moves as she traveled with her husband during his NATO service. Dolls are much more than temporary playthings. Dolls help children practice adult roles and offer comfort in times of stress. 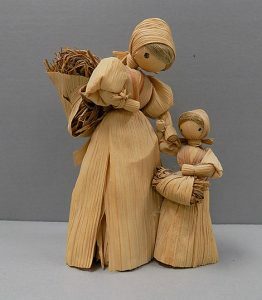 Dolls also reflect the societies from which they are produced allowing viewers to catch a glimpse of a different culture. This exhibit commemorated the 100th anniversary of the U.S. entry into WWI and offered an exciting glimpse into the experience of Alabamians during the war. In addition to detailing the life and impact of Dr. Gorgas, renowned physician and Surgeon General of the U.S. Army, the exhibit delved into the lives of soldiers and students affected by the war. Important topics included Camp Sheridan and the lauded 167th division. 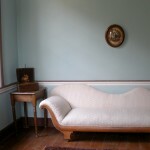 The Gorgas House Museum has been renovated to its 1890′s condition; shortly after Josiah and Amelia Gorgas moved into the residence. The renovation process involved remodeling to the structure, electrical, plumbing, wood work, plaster, and furniture, to restore it to its original condition, with the exception to a few modern necessities. 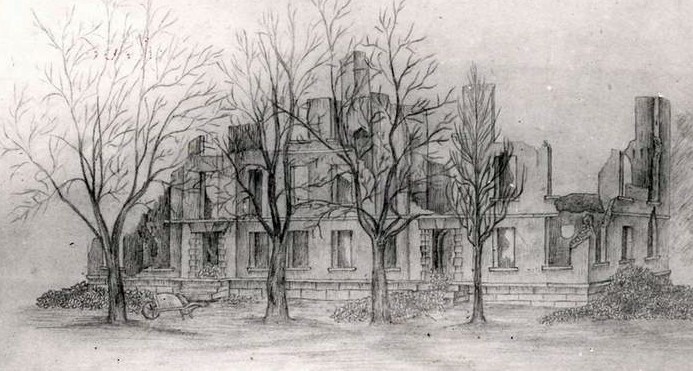 The Gorgas family collection comprises the permanent exhibition, showcasing a residence in the 19th century. 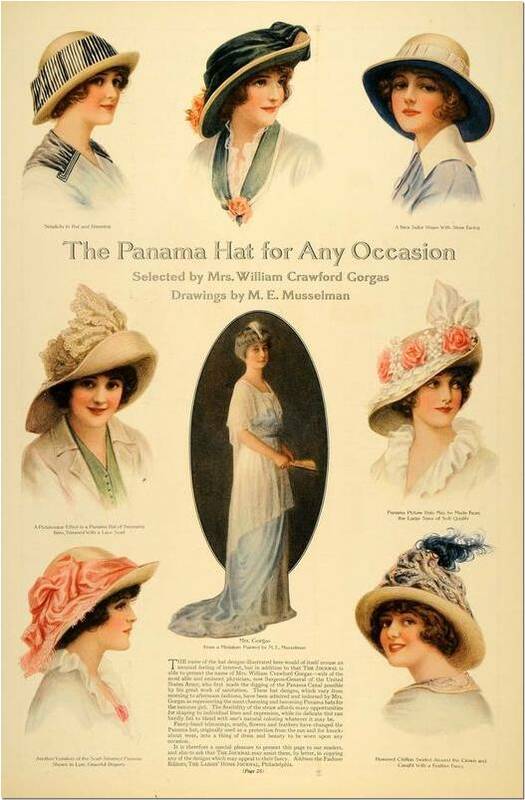 In 2012, the Museum debuted its first temporary exhibition, Panama Hats: Fashion and Fortune. 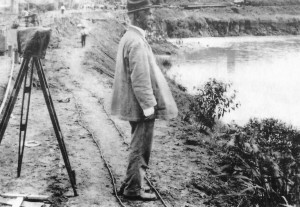 The exhibition featured Dr. William Gorgas, his wife, Marie Doughty, and their connection to Panama.In 2014 the Panama Canal celebrated the centennial anniversary of its opening and the first passage of ships through the canal. Click the image to view the exhibition as a slideshow. In 2014 the Panama Canal celebrated the centennial anniversary of its opening and the first passage of ships through the canal. The Gorgas House Museum celebrated the work of Dr. William Crawford Gorgas as the United States Military’s Chief Sanitation Officer in the Canal Zone with an exhibit during the year. In 2013, the Museum featured the collaborative work of an undergraduate art history student in an exhibition, Jefferson Hall. The exhibition featured artifacts from Jefferson Hall, one of the original dormitories on the University of Alabama campus. The Gorgas House Museum welcomes assistance with research for exhibitions, exhibition ideas, as well as the loan of artifacts for exhibition purposes. 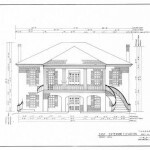 Please call 205.348.5906 or email gorgashouse@ua.edu for more information.